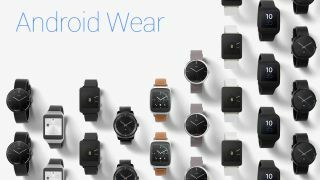 Fossil is getting into the wearable game as the company announced its first Android Wear smartwatch, developed in partnership with Intel. At the Intel Developers Forum, the watch maker revealed a trio of "connected accessories" powered by Intel. Fossil, being more of a fashion brand than a straight-forward watch maker, introduced a connected bracelet, a connected watch (seemingly not running Android Wear), and, finally, a smartwatch running the Google-made OS. Upon first blush, Fossil's Android Wear smartwatch looks like a carbon fiber copy of the Moto 360 from its circular frame down to the black bar on its chin. Of course, unlike Motoralla, LG and Samsung, you can be sure Fossil will include more aesthetic options, including silver and gold trim with leather and metal bands - similar to the more expensive versions of the Apple Watch. Fossil's Greg McKelvey also noted his fashion brand will make connected watches for Michael Kors and Kate Spade as well. Fossil plans to announce more details in the future, including features, price and the smartwatch's final name.